Nominal cooling capacity 278 - 713 kW. Nominal heating capacity 270 - 693 kW. 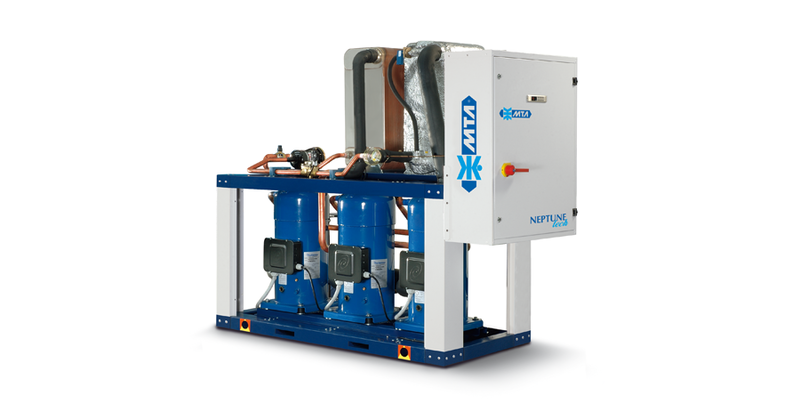 NEPTUNE TECH is a series of MTA water cooled chillers and heat pumps with inversion cycle on the water side designed for outdoor installation with environmentally friendly R410A refrigerant gas . 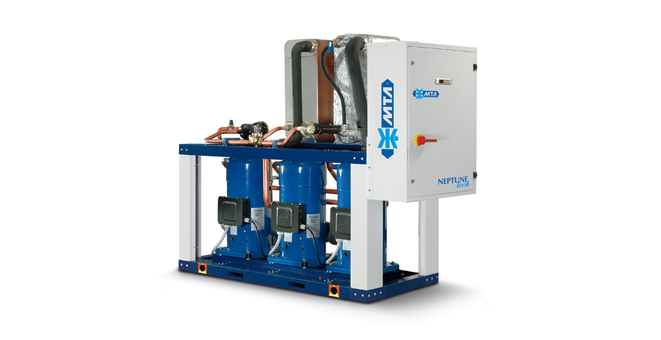 The water cooled chillers of the NEPTUNE TECH series, offered in a large number of models, versions, and layouts, respond optimally to the complex requirements of process cooling application. The multi-scroll logics, adopted across the entire series, allow maximisation of the performance indices with partial loads which account for the largest portion of the working life of an air conditioning unit. Particular attention was paid to the dimensions of the space of these units that must be transported within technical rooms that are often difficult to access. Data declared according to UNI EN 14511:2013.Nominal cooling capacity: data referred to nominal conditions, evaporator water temperature IN/OUT 20/15 °C and condenser watertemperature IN/OUT 35/40 °C.Nominal heating capacity: data referred to nominal conditions, evaporator water temperature IN/OUT 12/7°C and condenser watertemperature IN/OUT 40/45 °C.